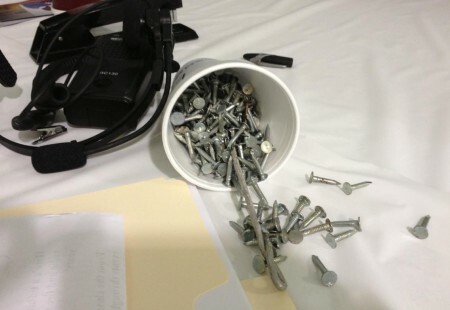 A truck affixed with Obama stickers drove through the parking lot outside of a tea party rally in Racine, Wisconsin on Saturday and dumped nails. Anne Sorock from Legal Insurrection was at the rally and posted this picture. These nails were picked up off the lot. Here’s another shot of the parking lot nails. Tea Party organizer Nancy Milholland sent this picture. And, Wisconsin radio host Vicki McKenna, who spoke at the rally, sent this. There were probably a couple of hundred roofing nails. At least one person got a flat tire because of it. Two cars were trolling ahead of the event (with Obama stickers on their cars), but no one saw them or anyone throw the nails. I was told the nails were NOT there when our organizers arrived. So, from what I can gather someone had to have scattered them after our guys arrived. Which is why those two cars were suspicious. It wouldn’t have been hard to throw the nails and not be noticed. we didn’t have a lot of security there at all. We have their license plates. I put up a tweet pic of some of them. 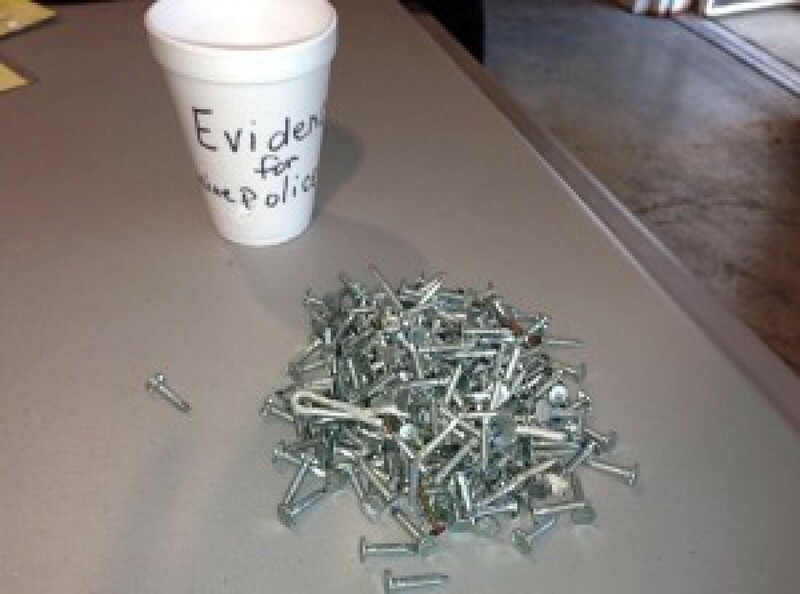 Jeremy Segal was here, too… He may have snapped a pic of the giant cup of nails that our people picked up from the lot.